The Washington Blue Sox and the Manitoba North Stars battled to a 2-2 tie to open up today’s action on the auxiliary field. The Blue Sox kick-started the offense in the fourth inning when Yudai Nakamura came home on an error and then Kyle Stahl scored on Yuta Tadano’s single to make it 2-0. The North Stars responded in the bottom of the fourth when Frank Podkul drilled an opposite field solo home run to cut the lead in half. Konosuke Kawagishi led off the fifth inning for the North Stars then scored the game-tying run on Jordan Hurtt’s hit. Moments later, Eric Elkus attempted to score on an Ethan Gofstein single, but a strong throw from right fielder Minami Kurahata saved the game for the Blue Sox and kept it a 2-2 game. That was the second tie of the season for each team, moving the Blue Sox to 2-5-2 while the North Stars have a 3-5-2 overall record. In the first game at Palm Springs Stadium, the New York Colonials took down the British Columbia Bombers 6-4. After trailing 4-1 early, the Colonials scored five unanswered runs over the final four innings. In the bottom of the fourth, Elijah Collins led off with a triple on the first pitch, then came in to score on a ground-out to cut the deficit in half. The Colonials tied the game in the fifth. With two-outs and the bases loaded, Collins hit a routine ground ball to second, but the Bomber second baseman misplayed the ball, leading to the tying runs to come across. The Colonials took the lead in the sixth. First, Lance Montano drove in the game-winning run with an RBI double. Gregory Barnett rounded out the scoring and provided insurance with a sacrifice fly to right. Alex De La Cruz-Rodriguez finished 1-for-3 with a two-run double, a walk, a run, and a stolen base for the Bombers. Despite entering the game in the fifth, Montano finished 1-for-2 with an RBI double, two runs, and a stolen base. 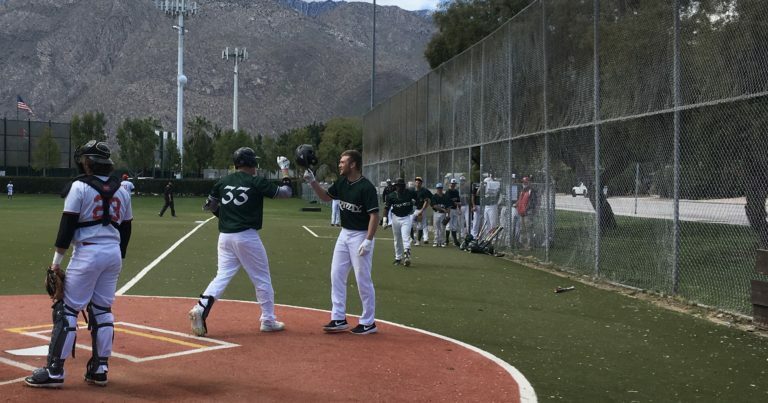 The auxiliary field played host to a shutout in game two as the Alberta Grizzly took down the Palm Springs Power by a score of 9-0. The Grizzly came out of the gates quickly when Bill Pearson and Ryan Whitt laced back-to-back singles then came around to score later in the inning to make it 2-0 after the first. Alberta broke things open in the second inning when they added three more runs on two hits to make it 5-0. Colten Trager’s moonshot in the fourth inning added two insurance runs to the Grizzly lead to make it a 7-0 score. Alberta rounded out the scoring in the seventh inning when they pushed across two more runs that culminated in the 9-0 final score. Whitt, Trager, and Chip Northrup were responsible for all the Grizzly RBI’s on the day as Alberta improved to 6-3-1. The Palm Springs bats were stymied by Noah Lashley, who threw five strong innings and only gave up three hits while striking out one batter, which pushed the Power’s season record to 4-5. In the final game of the day, the Canada A’s blew out the Palm Springs Chill 10-3 at the stadium. A’s starter Kyle Lazcano tossed four scoreless innings, allowing just two hits while striking out six. Canada scored a pair of runs in the second on ground-outs, then went up 3-0 after Ben Mauseth’s two-out RBI single in the third. The Chill cut the deficit to one in the fifth on back-to-back two-out base hits. First, Nicholas Mira drove in their first run with a double. He came into score two batters later on a Brian Pozos single. The A’s blew the game open with seven runs in the bottom half. First, Derek Bangert crushed a three-run home run over the left centerfield scoreboard to make it a 6-2 game. Later in the inning, Bodie Bryan blooped a single into center to score two more runs. Joseph Becht stole home for the ninth run, and Braydon Gomes drove one in with a single for the tenth. Evan Weidner rounded out the scoring with a one-out RBI single in the top of the seventh. Joshua Henderson finished 2-for-4 with two runs and Mauseth finished 2-for-2 with a double, two runs, an RBI, and two stolen bases for the A’s. Mira and Pozos both finished with two hits for the Chill. Tuesday will be 2-for-Tuesday, 2-for-1 admission on tickets, $2 soft drinks, and $2 hot dogs. The Washington Blue Sox take on the Oregon Lumberjacks in the first game at 10 AM, followed by the Oregon Lumberjacks taing on the British Columbia Bombers at 12:30 PM.